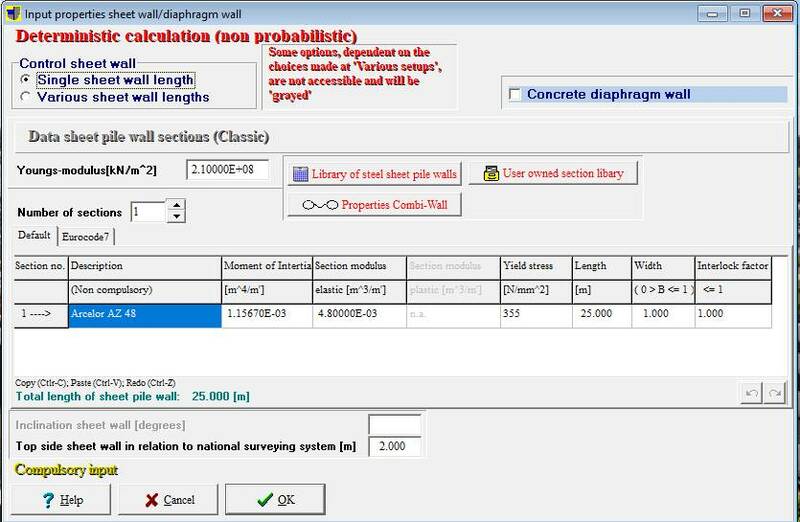 With the aid of this program the displacements and the force distribution of a sheet pile wall construction can be calculated. 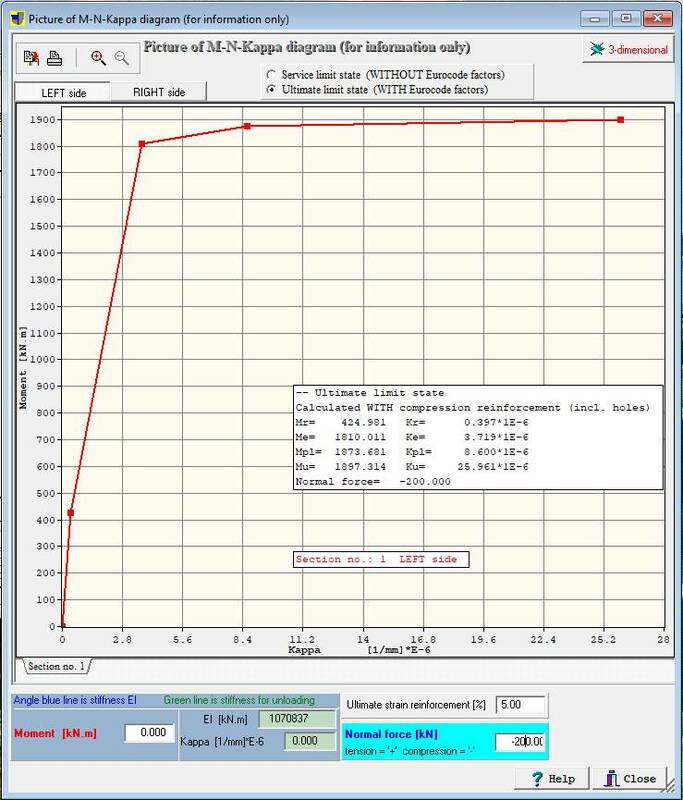 The figure below gives an impression of options present into the sheet pile wall program. Impression of the per construction phase calculated moment, shear force and displacement distributions. Impression of the per construction phase calculated water and total pressure distributions at the left and right side of the sheet pile wall. The program has the capability to locate the top of the sheet pile wall, the place of anchors, soil layers etcetera according two different systems of axes. a. Vertical axis pointing downwards. The zero point is the top side of the sheet pile wall. b. Vertical axis pointing upwards. The zero point is that of the national surveying system of levels. The sheet pile wall in vertical direction can consists out of more than one section with different values for the moment of inertia and elastic modulus. The default acting width of the sheet pile wall is 1 m. This values can be decreased, by which graduated sheet pile walls can be calculated for example. Further the program has a design option by which the length of a sheet pile wall from a entered start length and with a certain step size by the program will be enlarged automatically. For the input of the section properties of a sheet pile wall these can be loaded from a standard library of commercial available sheet pile sections included. 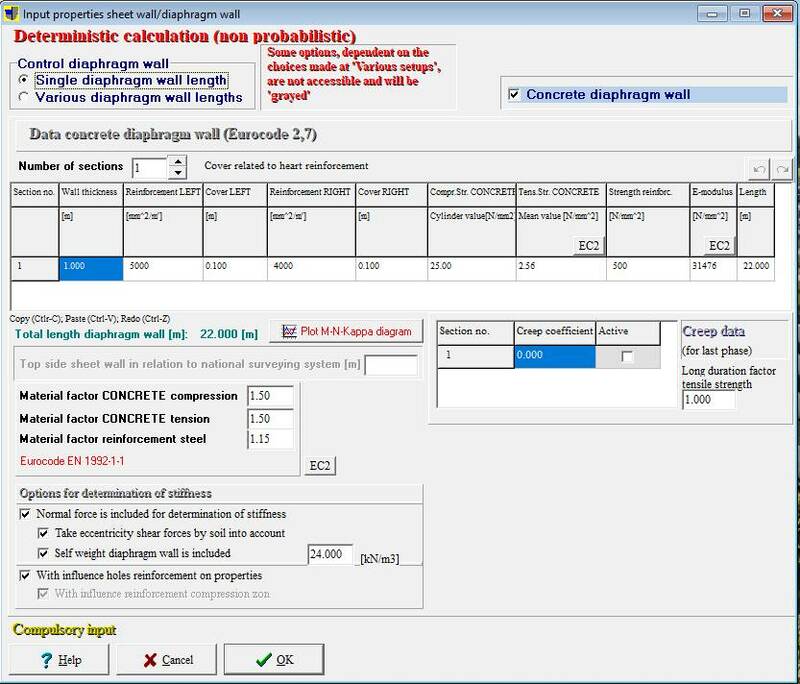 The program has the ability to calculate the cross-section properties of a so called combi wall, existing of circular shaped tubes with standard sheet pile sections in between. At default the orientation of the sheet pile wall is vertical; an option is present to give the sheet pile wall a certain inclination. c. Surface level is: bended; consisting of n bend points and n-1 straight lines (Culmann method). 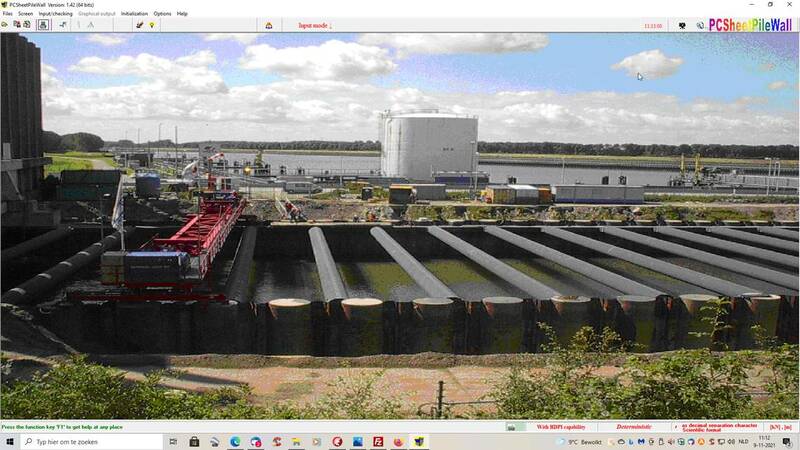 The program has no preference with regard what will be entered al the left of right side of the sheet pile wall. The excavations at the 3 figures above could have taken place at the right side also. From the entered (ground) water level to below a hydrostatic build up of water stresses takes place. The volume weight of the water is by default 9.81 kN/m3, but this can be changed by the user when needed. Per entered soil layer, in relation to the hydrostatic stress distribution, an extra under or over water pressure can be entered if necessary; provided that this option is switched on. The under and over pressures can be entered. 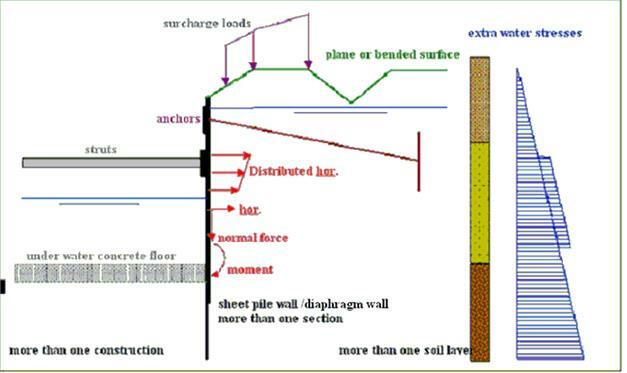 Dependent on the choice for the kind of surface level (see at preceding point 3) different kinds of surcharges acting onto the surface level per construction phase can be entered at the left and/or right side of the sheet pile wall. c. Surface level: bended; existing out of n bend points and n-1 straight lines (Culmann method). Further at an arbitrary place onto the sheet pile wall a vertical line load can be placed. For the calculation it is taken into account that this vertical normal force has an influence on the size of the moment distribution at the sheet pile wall (2e order effects caused by the deflections of the sheet pile wall). Dependent on the choice at various setups the strength and stiffness properties can be entered at a different way. - the user does enter the horizontal active, neutral and passive effective stress coefficients (labda values) directly into the program. 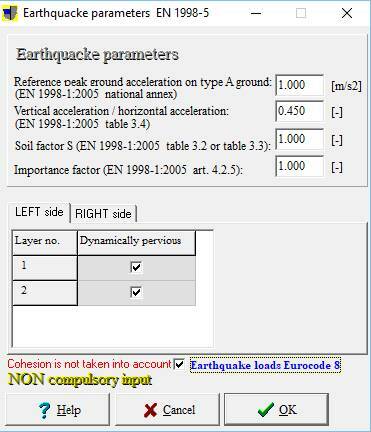 When the choice has been made for bended surface levels (Culmann) or sloping plane surface levels than the second option is not possible however. When this is setup the number and properties of soil layers can be different for each construction phase, otherwise the soil properties are equal for all construction phases.. The stiffness of the is reproduced with the aid of a spring constant This spring constant can have a linear distribution in size over the thickness of a soil layer. The choice can be made for a linear course of the spring stiffness between the active and passive displacement or a non linear course (tri-linear). The values of 50% and 80% are the default values; these can be changed by the user however. The input of data into the program is divided into the next parts. 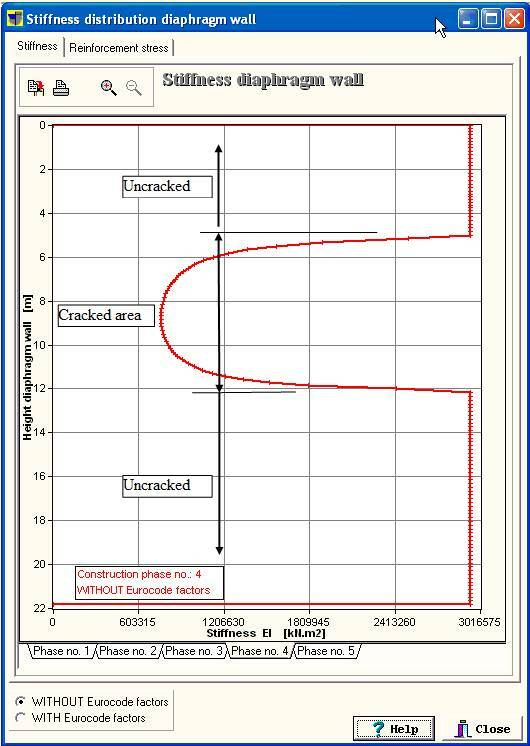 With the entered properties of a concrete diaphragm wall the cracked bending stiffness will be calculated by the program (a so called M-N-K diagram). Next to the non-linear behaviour of the soil the behaviour of the diaphragm wall is non-linear too therefore. For a deterministic calculation the basic assumption is fixed values for the various input parameters. For a probabilistic calculation the basic assumption is a probability distribution for the various input parameters (a specialty of PCSheetPileWall). A deterministic approach is the usual method in practice. The probabilistic approach is a more advanced method, which for three failure mechanism (soil collapse, sheet pile wall collapse, collapse of anchor(s)) does calculate the probability of failure. Furthermore the influence per statistical parameter (stochastic variable) on the total probability of failure will be calculated, from which follows which stochastic variable is more or less important for the calculated probability of failure. A probabilistic calculation should be performed at a development phase that the design, with classical deterministic design methods, has been fully thought trough only (it’s a check afterwards). A probabilistic calculation can be thought of as an automatic weighted sensitivity analyses. In the program it’s possible for a number of variables next to the expectation value to enter the standard deviation for that variable; with which the variable has become a stochastic variable. The stochastic variables have a standard normal probability distribution; unless decided otherwise. For the SOIL properties the stochastic variable can have a NORMAL or LOGNORMAL probability distribution. The advantage of the lognormal distribution is that the regarding variable will have a value always larger than zero. The soil strength properties in a physical sense cannot have negative values. For not to large standard deviations the differences between the normal and lognormal distribution are not so big. The (ground) water levels at the left and right side of the sheet pile wall are allowed to have a non normal probability distribution. For this input variables there are nine different probability distribution functions foreseen: Normal, Right truncated Normal, Left truncated Normal, Exponential, Gumbel (type I extreme distribution for largest values(, Type I extreme distribution for smallest values, Weibull (type III extreme distribution for smallest values), Uniform and LogNormal. Knowledge of the backgrounds of the probabilistic theory is very essential for the use of the program.